The very word, I admit, makes me want to sit down. Play it safe. I say, "Do I have to? I don't want to!" I was led to the deep end of the pool during swimming lessons. I was told to jump in. I refused. I'm pretty sure my face was wet and it wasn't from the water in the pool. Authority won and I had to jump. The instructor had promised me that if I needed it, she would stick out a pole that I could grab hold of. Of course as soon as I jumped in, and there was nothing solid under my feet, I felt like I needed rescuing. When I reached up, the pole was not there! I suppose that instructor thought she was doing me a favour, thinking it would make me be brave. Sometimes our fears may seem irrational, but sometimes we have reason to fear and we need to work through those monsters before we can jump. We need to know there is someone there we can trust. If we are not prepared to jump, deeper fear will settle in. For a child who had survived cancer, but was left with half of her lung capacity and atrophied muscles, swimming for me was like the empty bottle in water, bobbling around briefly on the surface and then sinking fast. To be told to jump into the deep end, while extremely terrified, without a sure hope in the end, was not beneficial. 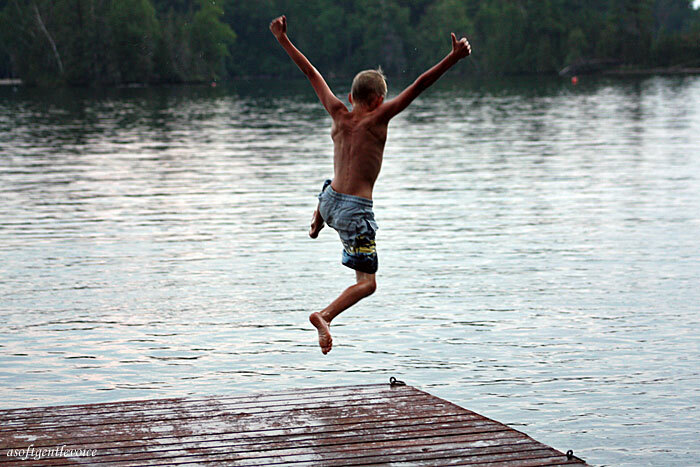 Thirty years later, on a hot summer day, I ran right off the end of the dock. Jumped right into the dark water, celebrating a call from the hospital with test results just returned. All clear! As a woman now at high risk for a secondary cancer, each summer I am to return and have an MRI scan to make sure cancer stays away. Sometimes the bigger fear is not the jumping, but fearing the possibilities. But whatever our possible reality might be, we never have to jump alone. No one hovers over us with a pole purposefully out of our reach. Whatever we may face, we can call out to a powerful God who loves us with arms stretched out wide desiring us to jump right up and into His loving and tender embrace. Something in your life that it is so terrifying that you can hardly move? Can't jump? And you have every reason not to? But you have no choice? You have to! Jump. But, before you do, know that you are being held and strengthened by the God of hope. Reflecting and writing on the word prompt given here for Five Minute Friday at Lisa-Jo's place. Beautiful! How interesting that you wrote about jumping into water at a swimming lesson and I did, too! I love how you summed it up at the end, though, and my favourite line was, "Sometimes the bigger fear is not the jumping, but fearing the possibilities." Definitely true with me sometimes. Thanks for the reminder that God is always with us in all our 'jumps' in life! Beautiful post. I remember taking swimming lessons as a kid, and I had this intense fear of the water. I still don't like the water today. I am thankful your cancer scans have been clear! Thank you for the reminder that God is always with me and that's it's okay to jump! Rejoicing over your clear cancer scan! Thank you for the encouragement always found here. You are an inspiration. "Whatever we may face, we can call out to a powerful God who loves us with arms stretched out wide desiring us to jump right up and into His loving and tender embrace." These words will be on my heart today! Blessings to you. What a wonderful joy to have. I loved your post. It doesn't help us to be dropped into our fears, but it is so exhilarating to jump into them on our own. Praising God for the good report.